Today I would like to introduce you to the bakery company called Rudi's Organic Bakery where you will find all kinds of freshly baked items that can be delivered directly to your front door! You can also find their delicious products in grocery stores across America. When you shop Rudi's Bakery you will find a variety of organic breads, organic bagels, organic muffins, organic buns and rolls and even organic multi-grain wraps! My Review: Today I am reviewing the organic Multigrain Oat Bread from Rudi's Organic Bakery for all of you. This bread is made with ingredients you can pronounce and with ingredients you recognize. This bread is USDA organic certified and contains NO high-fructose corn syrup in it at all. As we all know...consuming corn syrup is not a good thing! Each slice of this "healthy" oat bread contains 2g fiber and 3g protein per slice! Their multigrain oat bread combines a little flour with organic wheat flour, delicious organic rolled oats and wholesome organic wheat bran. The bread is soy-free, dairy-free, organic, vegan and has no-GMO. We are big bread eaters here in our home so for the past few months we have been trying to stick to organic breads as they are definitely the most healthiest choice. We decided to try this bread first for breakfast as our morning toast alongside some organic fried eggs. The following day we used it again as a sandwich bread for our lebanon bologna sandwiches. Ever since day one, we have been using this bread and let me tell you...it is delicious! At first I wasn't sure if my family would like an "Oat Bread" but after just one slice we are all converts! The Rudi's Organic Bakery bread has a really nice texture to it, nice flavorful taste to it and it definitely was fresh! 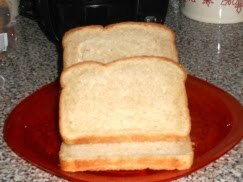 I also like the "thickness" of the slices...this is no whimpy bread! (what I mean is, it won't fall apart while picking up your sandwiches or really loading up your sandwiches with goodies, this bread can handle it!). My family loves this bread and we will be purchasing more of it at our local grocery store. Rudi's makes several different flavors and styles of bread and we will be trying a few of those out too! We highly recommend this company and their organic bakery products to you and your family. We think you will love them! I would like to thank Rudi's Organic Bakery for participating in this product review here on the Shakin and Bakin Foodie Blog. Your products are delicious! Disclaimer: Shelly Hill has personally reviewed the product listed above. Shelly has not received any monetary compensation for her review. Shelly did receive a free product to try out so she could evaluate and use it for her review. Her thoughts & opinions in this review are unbiased & honest and your opinions may differ. The Shakin N Bakin Blog is not responsible for delivery/shipping of giveaway items won from this blog nor are we responsible for mis-use or injury caused by items won from this Blog. Content on this blog is copyrighted, all rights reserved.